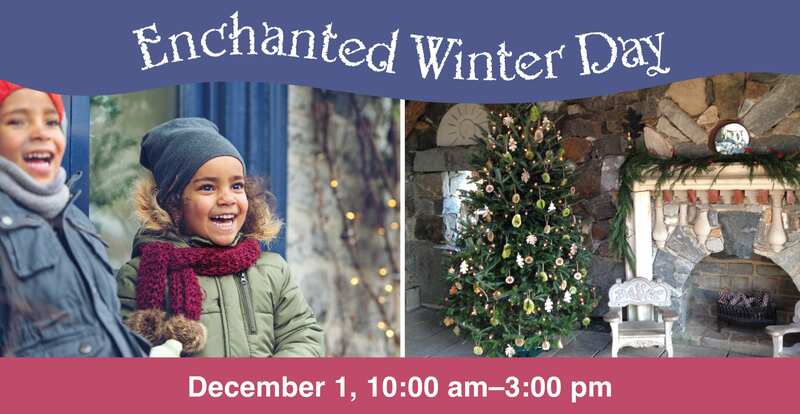 Welcome the holiday season with a day of family fun when you join us for Enchanted Winter Day! Holiday decorations will adorn Enchanted Woods, the Follies in our outdoor exhibition, and the greenhouses as you enjoy a magical winter walk through the woods or hop on our Garden Tram “sleigh ride," complete with holiday music. There will be plenty to do in the warmth of the indoors, including making kids’ holiday crafts and learning adult how-tos, marveling at magician Magic Tad’s tricks, watching The Muppet Christmas Carol family movie, and more! Included in admission is our famous Yuletide Tour—a wonderful way to get into the spirit as you marvel at H. F. du Pont’s mansion decked out in holiday splendor. The day is Members free; included with admission. Purchase tickets. Crafts: Kids can make their own ornament and gift wrap to give to someone special as well as make a craft for themselves to keep. Christmas Tree ID – Learn about the different types of Christmas trees, which ones are best for what environments, how to care for them, and more. Holiday Plant ID and Care – Learn about the different types of plants that are often given as holiday gifts (poinsettia, cyclamen, amaryllis, paper whites, etc.) along with tips for how to take care of them. Wreath and Bow Making – On display will be a progression of the steps involved in making a holiday wreath and bows and what materials you’ll need to make your own. Family film: The Muppet Christmas Carol will be shown in Copeland Lecture Hall several times throughout the day. Performers: Be wowed by the sleights of hand of magician Magic Tad. Unique family holiday photo op: The Green Folly will be all decked out with holiday greens and decorations, creating a unique setting for a family holiday photo. A Winterthur staff member or volunteer will be on hand to take the photo so that all members of the family can be a part of it. There will also be an indoor holiday scene for photos in case of inclement weather. Yuletide Tour: An annual family favorite not to be missed, our magnificent holiday tour of Henry Francis du Pont’s mansion will fill your senses as you take in the breathtaking trees and dazzling room displays. Don’t miss our magical dollhouse, decorated in miniature holiday wonder just for the holidays. Yuletide Tour requires timed tickets. Reservations recommended. Capture your favorite moments from the day and enter your photos into the Enchanted Winter Day photo contest. The winner will receive a Family Membership (or renewal) to Winterthur—good for a whole year! All submissions will also be considered for use in future Winterthur marketing and advertisements. Images must be .jpg format and between 1 to 2 megabytes in size. Do not use Photoshop filters on images. Up to 5 entries per person. Winterthur staff are not eligible to participate. Use of your content: Sending your content to us implies that you take full responsibility that your submission is completely original and grants permission for Winterthur to edit, publish, and reuse your content, giving due credit but no financial award. *Event is rain or shine and you can bring your own blanket for the "sleigh ride." **Please note that Enchanted Winter Day is reserved for Winterthur members or paying guests. AHS, ROAM, and NARM reciprocity is not available on this program day. Thank you for your understanding!